Edgar Degas (French, 1834–1917), Dancer Holding Her Right Foot in Her Right Hand [Danseuse tenant son pied droit dans la main droit], ca. 1904; cast 1919–20. Bronze. Purchase, Bradley Conservation Endowment Fund M1984.70. Photo credit: John R. Glembin. Though many of his formal principles are similar, Edgar Degas (1834–1917) stands out from the other major Impressionists because of his decision to depict urban spaces and the people that inhabit them, rather than natural landscapes. Arguably Degas’ most famous subject is the Parisian Opéra and its ballet dancers. Degas began portraying the Opéra—its stage, practice rooms, and dressing rooms—and ballet dancers in the late 1860s in drawings, paintings, prints, and sculpture. In the late nineteenth century, ballet dancers were essentially urban workers; they toiled away in practice rooms for countless hours at the expense of their bodies. These women were in a similar social position to Degas’ other subjects of urban labor: laundresses and prostitutes. The ballet was a subject that occupied Degas’ interest for the next forty years until his death. Though he exhibited and sold two-dimensional works of ballet dancers regularly, Degas only exhibited one sculpture in his lifetime: the Little Dancer Aged Fourteen (1878–1881). Degas sculpted many works in addition to the Little Dancer, usually in clay or wax, but did not exhibit them or had them cast permanently in metal. By the 1880s, his eyesight began to inhibit his ability to paint and draw, so he began to work more in wax and clay, which relied less on his sense of sight. After Degas’ death in 1917, about 150 pieces of sculpture were found scattered in his studio. One of the sculptures was the original sculpture which provided the cast for Milwaukee Art Museum’s Dancer Holding her Right Foot in her Right Hand. 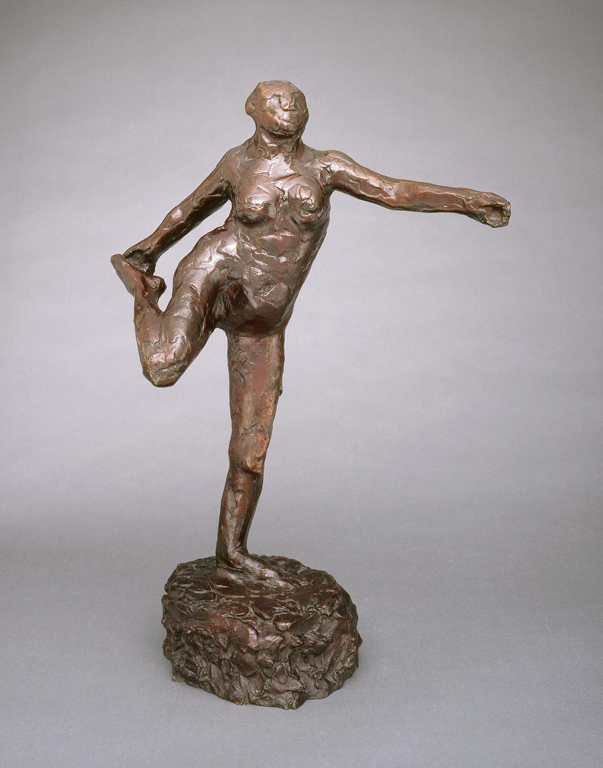 This sculpture is a cabinet-scale ballet dancer balanced on one leg as she reaches behind to grasp her right foot with her right hand, her left arm extended forward as a counterweight. About ten years after Degas’ death, his heirs decided to have casts made of Degas’ sculptures. Of the pieces found in his apartments, just over seventy were deemed suitable for reproduction. The heirs believed it was necessary to cast these in bronze out of fear that they may be lost over time due to their poor condition. This original looks strikingly similar to the bronze edition because of the color, though this is due to darkened wax which collected dust and dirt in Degas’ ill-kept studio. Surprisingly, Degas never took himself seriously as a sculptor; he both admired and practiced sculpture, all while discrediting his own efforts. Though he consulted with friends who were sculptors, Degas’ techniques were not traditional. Edgar Degas (French, 1834–1917), Dancer Holding Her Right Foot in Her Right Hand [Danseuse tenant son pied droit dans la main droit] (detail), ca. 1904; cast 1919–20. Bronze. Purchase, Bradley Conservation Endowment Fund M1984.70. Photo credit: John R. Glembin. In contrast to the usual monumental marbles and bronzes exhibited at the Salon, Degas’ works are mostly small scale and are built using clay, wax, and whatever Degas found around his studio for structural support, including paintbrush handles, wire, and bits of twine. But Degas was wrong. Many people do talk about his sculptures, both those finished and unfinished. Despite the interest in them, many scholars have difficulty placing Degas’ sculptures within the context of nineteenth-century sculpture and largely relegate discussion to Degas’ other two-dimensional depictions of ballet dancers. The problem lies in the sculptures’ difference, in both form and subject, from traditional nineteenth century sculpture, which was dominated by monumental sculptures of mythic or ideal subjects. The sculptures exist somewhere in between tradition and modernity, like much of Degas’ other work. While Degas’ materials and techniques are acceptable as sculptural studies, his decision to never work three-dimensionally in bronze or marble sets him apart from traditional sculptors of his time. In subject, the ballet was a relatively more subversive subject than it is today. Ballet dancers were often pulled from the lower, working classes. While the work was arduous and had only a small chance of success, the career of a ballet dancer offered social mobility. Often, this social mobility was afforded to a dancer by a wealthy male patron (perhaps most famously represented in Emile Zola’s Nana, whose title character achieves fame in the Opéra), leading to their association with clandestine, unregulated prostitution. In a way, these sculptures are supremely representative of Degas as an artist. They are unusually composed, created with experimental materials, portray urban subjects, and are perpetually unfinished. While Degas’ sculptures, like Dancer Holding her Right Foot in her Right Hand, have been immortalized in bronze, do we consider them to be complete works or merely studies? 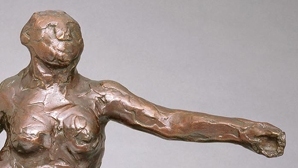 While it is important for viewers to remember that these sculptures were not exhibited and exist in various states of completion, Degas’ sculptures are works of art to be considered in their own right. Like any other number of incomplete or works-in-progress—such as da Vinci’s sketch books or Bernini’s bozzetti—Degas’ sculptures offer a unique insight into the artist’s genius and working process. This entry was posted in Art, Curatorial and tagged 19th Century Art, 20th century art, Collection, Edgar Degas, European art, From the Collection, Women in art. Bookmark the permalink.